Next time you drive northward through those annoying blind curves on Rafael Drive, visualize yourself in the land of opportunity that was San Rafael of the late 1880s. Imagine for a moment that you have ventured by horse-and-carriage between the stately stone pillars that guide you gracefully upward through the curving elegance and manicured grounds of the grand Victorian Rafael Hotel. America’s Civil War is recent history and World War I is not yet imagined. Anybody who is anybody is preparing to go to the Paris World Fair (1889) for the unveiling of the Eiffel Tower. Meanwhile, San Francisco’s robber barons and wealthy socialites are fleeing the summer fog to cavort in summer homes on this side of the bay. Coleman cavorts with a cast of interesting characters, including Robert Watt, a mining engineer who introduced the cable car to San Francisco (note the street named after him that marks the north end of the hotel grounds). James Wilkins owns the Marin County Tocsin, one of Marin’s earliest newspapers. There was James Mervyn, who is the son of railroad magnate, Peter Donohue who built the North Pacific Railroad, which ran the North Shore branch (Tiburon to Petaluma) with a station within walking distance from the hotel. Other investors include Arthur W. Foster, railroad banker and a founder of what is now the Marin Academy, and William Babcock whose elaborate summer home, Edgehill, will be given to Dominican and magnificently restored in 2010. San Francisco architects Curlett & Cuthbertson, inspired by the elaborate Del Monte Hotel in Monterrey, design a slightly less elaborate building for the San Rafael site. San Francisco’s social elite come by ferry or steamer to Point San Quentin or Tiburon, then by train or horse and carriage, to San Rafael through the stately entry pillars. 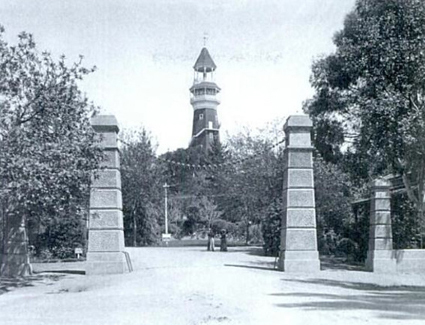 Gates to Hotel Rafael, Courtesy Marin History Museum. The Hotel brochures boast various activities, including horsemanship, bowling, billiards, dancing, tennis, yachting, golf, sailing, and fishing. Bathing was also available at the San Rafael Municipal Baths, which featured a two-story water slide into a huge indoor swimming pool. In 1895 old man Peter Donahue dies, and his son James and James’ sister, Mary Ellen (Mamie), inherit Peter’s fortune. This new infusion of money brings on a most colorful character, the handsome, debonair, wealthy, German Baron John Henry von Schroeder, who wants to parlay Mamie’s inheritance into something big. He buys out Coleman and embarks on a grandiose expansion of the hotel, including the innovation of electricity. The baron operates the hotel in a wine-and-dine whirl of gentleman (stag) parties, complete with poker, billiards and…women. The plot thickens, yet disaster looms for the hotel. Fast forward to a brand new century: January 4, 1900. The San Francisco Morning Call features the Baron’s intoxication and other shocking scandalous behavior in San Rafael. In the first big “show trial” of the century, the Baron is charged with throwing wine bottles from hotel windows, and “making love” in the resort’s garden maze. To say nothing of “ogling” women at the Tiburon ferry slip. After a jury decides against him, he appeals with a libel suit, and achieves an empty victory. His family has already returned to Germany, so he returns as well, and later rises to a high level in the German military. 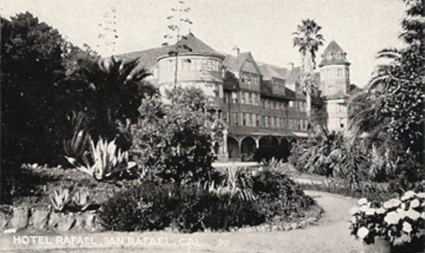 In 1915 the hotel is turned over to a World War 1 General named Warfield, and the University of California Regents hold the mortgage. In 1918-19 the influenza epidemic converts the hotel into a hospital. Dominican Sisters, Red Cross volunteers—everyone—pitches in. It’s said that the wealthy adventurer, philanthropist Louise Boyd, sent her chauffer to transport afflicted victims to the facility, and that she personally dumped bedpans. When the health crisis ends, the building is leased to two Oakland hotel men who electrify all the lights and install an Otis elevator. Best of all, 40 private bathrooms are added, and the hotel re-opens in 1920-21, ready and raring for the twenties to roar. The new era brings Chamber of Commerce events, service club meetings, receptions, balls, dances, and proms. But the glory days have faded in the shadow of the newly ubiquitous high-speed automobile. The motorized vehicle turns the destination resort into a mere lunch stop on the way to more distant destinations. Submitted by Joan Nelson at the exact location (70 Rafael Dr.) of the elegant port coucher of the Hotel Rafael.